Cozmo is just one of our canine cancer heroes. Georgia’s Legacy is seeking your stories of hope and courage to share with other pet owners whose dogs have been diagnosed with cancer. Has your dog been enjoying a long remission since being diagnosed? Has your dog beaten the odds and survived far beyond what was predicted? Was your dog’s cancer cured? Did your dog learn to successfully overcome an amputation or other physically altering surgery without missing a beat? We are also looking for your stories or advice about home remedies that worked for you during treatment or clever solutions you’ve come up with to help deal with some of the common side effects of cancer treatments, including how to get your dog to eat/drink if they don’t want to, how to overcome mobility challenges, or how to get them to take their meds. 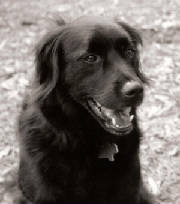 Georgia’s Legacy is the canine cancer resource by pet owners for pet owners. Its mission is to educate and inform pet owners about how to prevent and treat cancer so dogs can live longer, healthier lives. By sharing your stories, experiences and advice, you will help make the journey a little bit easier for others going through cancer with their pups. If you have a great story or idea to submit, email georgiaslegacy@fightcaninecancer.com. We want to hear from you!! You can also visit our Facebook page and post your comments or ideas there. This entry was posted in News and tagged Cancer Treatments, canine cancer, canine cancer stories, canine cancer treatment, dog cancer, dog cancer resources, fightcaninecancer.com, Georgia's Legacy. Bookmark the permalink. Our 9 year old golden retriever (we thought he was 8, he’ll be 10 in May) was diagnosed with hemangiosarcoma last October 2009. He stopped eating and I thought it was his teeth. When we took him into see his vet she checked his abdomen and took him in for emergency surgery. His abdomen was full of fluid and blood. She removed his spleen and did a biopsy on it. Her diagnosis was was grim. Our choices seemed small. But I decided that as long as his spirits were up and his quality of life was good we would try any treatment we could. Mike started chemo in October not long after his diagnoses. I thought I would be happy just to see him make it to Christmas. He had a wonderful Christmas on the beach of Whidbey Island. Mike finished his chemotherapy in January. He is now on a protocol to continue his health. I know that it is what we have for now. He is happy and his quality of life is wonderful. I had no idea he would still be here. Especially doing so well. So Mike is getting spoiled rotten. And enjoying every minute of it. I wish all who come to Georgia’s Legacy good blessings with your Furface!